Last week, Oxfordshire coroner recorded a verdict of “death by unascertained natural causes” which he compared the death to sudden adult death syndrome which is linked to cardiac illness. What killed Alfredo Duran since the coroner stated that he was healthy and Red Bull has such a long sale record as far back as 1982 and had since sold 3.5 billion drinks in 140 countries in 2007? Overdose of caffeine and an enlarged heart are probably the resultant cause. As he had to work up to five night shifts a week, 40-year-old Alfredo, a father-of-two was known to consume at least 4 cans of the Red Bull each night. The amount of caffeine found in him although not fatal by itself, could have triggered a card­iac arrest for someone who has already an enlarged heart. According to the pathologist, this will not have any effect in people with a normal heart. 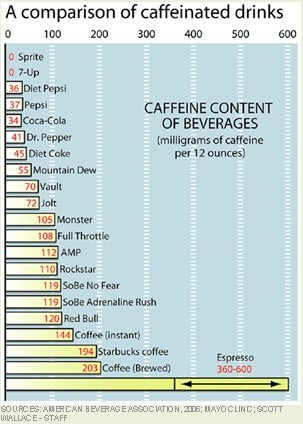 Looking at a chart from the American Beverages Association, taking a can of Red Bull is pretty close to a cup of instant coffee (hmm, Sprite & 7-Up no caffeine). Although caffeine is not addictive, a consumer may go for additional can of energy drink to stay awake once he starts to lose that peppy feeling. However, it is also known that when people take too much caffeine, side effects like nervousness, insomnia and elevated blood pressure will be experienced. That being the case, one can imagine how it will be like downing 4 cans of the Red Bull. In fact, some countries banned it because of fears of causing high blood pressure. Still, Red Bull said that “clin­ical tests and toxicological evaluations by independent experts had concluded it was safe to drink for adults” . Just don’t drink more than 2 cans, they said. Understandably, they are in a market which according to market research firm ACNielsen clocked $4.7 billion in 2007 up from $3.5 billion in 2006 and expecting to grow to $10 billion by 2010. Yes, many consumers will swear by it as several studies have indicated that energy drinks may help boost cognitive performance, verbal reasoning and attention levels. However, other experts are saying that there is nothing unique in them that sustain the alertness. Rather, it is the work of the high sugar and caffeine in them which one can easily get from other sources like coffee and candy bars. For me, no coffee during my “night-shift” writing this blog. I will just head for the aromatic kopitiam’s coffee-O in the morning.